This high-rise hotel faces the rebuilding site of World Trade Center, and the 9/11 Memorial and Museum. St. Paul's Chapel is across the street, the World Financial Center is 1 block, and Tribeca is 4 blocks away. 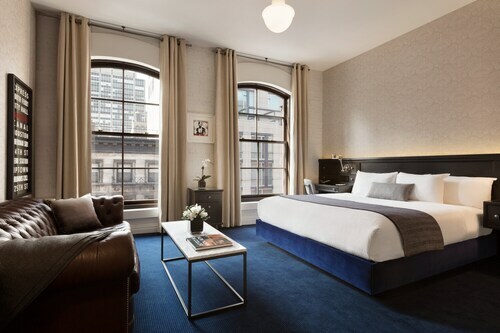 The Frederick Hotel is located at 95 West Broadway, just a few blocks away from the National September 11 Memorial and Museum, Brooklyn Bridge, the World Trade Center Mall, and New York City Hall. Greenwich Village is within walking distance as well as Wall Street and the Financial District. The Frederick Hotel offers easy access to all New York City attractions with the Chambers Street subway station conveniently located in front of the hotel. 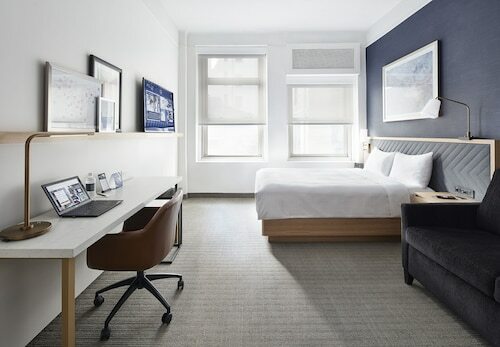 Located in the heart of lower Manhattan's Battery Park City, this new, contemporary hotel is adjacent to Hudson River Park and in close proximity to many of New York's important landmarks such as the Statue of Liberty, Wall Street and the New York Stock Exchange, in addition to prominent neighborhoods, including TriBeCa and SoHo. 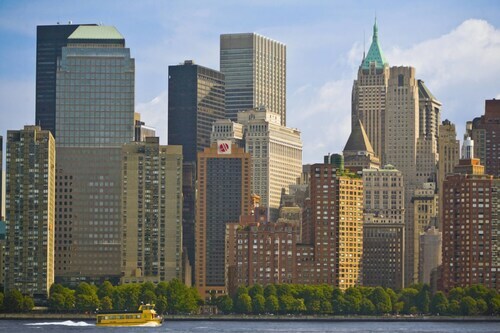 Situated in the Wall Street - Financial District neighborhood, this hotel is close to Trinity Church, New York Stock Exchange, Federal Reserve Bank of New York, and One World Observatory. Area attractions also include Battery Park and Brooklyn Bridge. One World Trade Center has a special place in the hearts of the locals. During your time here, you will meet plenty of fellow globetrotters who've also come to experience this excellent landmark. It's just one of several reasons that many worldly wanderers head to the wonderful city of New York again and again. 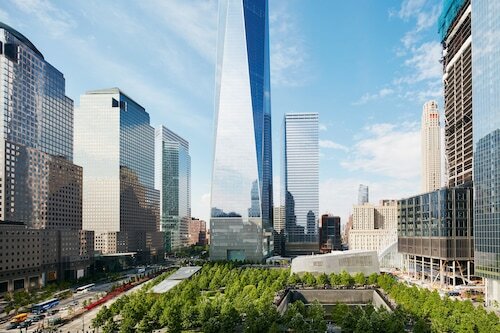 How you sleep at night can greatly affect your trip, and you'll certainly want to be in good spirits when you check out One World Trade Center. 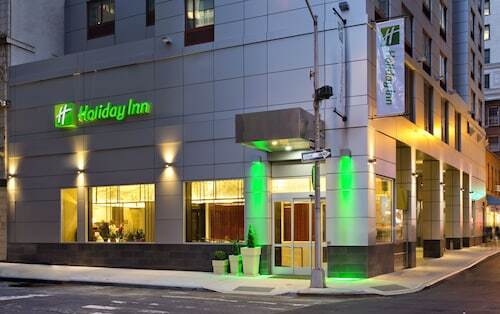 Luckily, there are as many as 35 hotels that are within easy walking distance. Start your search with the Smyth, A Thompson Hotel, The Ritz-Carlton New York, Battery Park and Roxy Hotel Tribeca. Your getaway doesn't have to cost you a small fortune. Look into the Courtyard New York Downtown Manhattan/World Trade Center, a decent budget solution, just 0.3 miles (0.5 kilometers) away. Intrepid travelers with a love for tasteful elegance will feed their desire with a night at one of the many reputable hotels here. Two choices are the Trump Soho New York, 1 mile (2 kilometers) away, and the James New York- SoHo, 0.8 miles (1.3 kilometers) away. If you'd love a brief pause from enjoying One World Trade Center, take the short walk to Financier Patisserie for a refreshing coffee. For those wanting something more substantial, One World Observatory is also nearby and offers a variety of delicious meals. Finish off a great day with some refreshing drinks at Del Frisco's Grille, another short walk away, and make sure you raise a glass to your poor colleagues back at work. See if you're able to organize a tour of World Financial Center, or simply indulge in some people watching. If business is your thing, you may like seeing Brookfield Place. Manhattan Waterfront Greenway is a lovely boardwalk where travelers and local folk can enjoy the serene nature of the waves. Check out the hustle and bustle of New York Mercantile Exchange, and see how business is conducted here. Head to National September 11 Memorial, a monument that is a window to the past. A ride on the metro is a convenient way to go to One World Trade Center. The closest station, World Trade Center, is only 0.2 miles (0.3 kilometers) away. Need insider tips on must-see attractions in One World Trade Center? Check out our One World Trade Center travel guide! How Much is a Hotel Room in One World Trade Center? 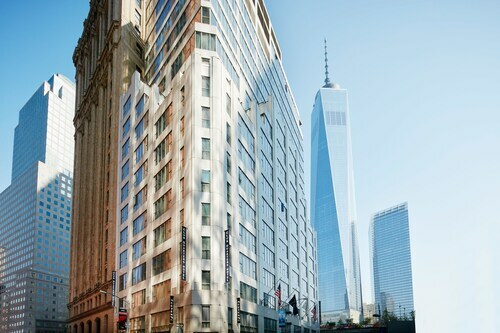 Hotels in One World Trade Center start at $95 per night. Prices and availability subject to change. Additional terms may apply.